This is a nice accessory for the IPod that looks good and sounds pretty decent, not great mind you. For the less discerning listener this is a perfect system for being on the go. In some ways the fact that the sound won't blast the doors of a room is a blessing. I bought this for my teenage son and he likes it to take into a room to play outloud . He loves to take it to the bathroomfor showering and I don't have to tell him to turn it down! The latest version (im3)does have DC so that takes care of the battery complaint. However rechargeable batteries do the trick for places without DC. The carrying case is very cool, a sleek little lightweight case that will protect the surface with velcro closures .Total size is about 10''x 6" which is amazing since it is super thin as well. I would recommend this little package for a cool little addition to your IPod to take your tunes on the road. Besides it looks so darn cool on a desk when you dock your IPod and let your musiclibrary play on shuffle. I wish I had gotten the larger system instead of the mini,but far from being dissapointed the sound quality is good.If you are traveling ,these are your choice.Small,easy to stow ,and you have sound.Take's battery's and come's with every converter for international travel.I like it. I needed a compact travel speaker system for my iPod Mini. After looking at the options, the iMmini speaker system seemed to be the best choice. It is very small, sturdy and lightweight, which makes it a perfect choice for travelers. It also sounds pretty good for as small as it is. It does get a bit distorted at higher volumes, but tweaking the iPod Mini EQ settings can usually help in that area. It's not loud enough to fill a room with sound, but it works perfect when sitting at a table having drinks or sitting out on a beach, etc. I'm taking mine to Costa Rica with me (along with several fresh batteries), and it's not going to make much of a dent in my luggage space...and that is exactly why I picked the iMmini. It also looks pretty stylishwith the silver iPod Mini. It's not a perfect sound system (especially if you are looking to blast the tunes like a boombox), but it's definitely a great choice if size and portability are desired. It's also worth noting that the iMmini works well with the iPod as a travel alarm clock unit. It may not be for everyone, but it's working out really well for me. 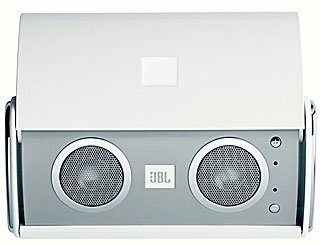 This system is certainly better than the JBL onstage docking speaker system, however it also has its drawbacks. Pros:very compact, user friendly, portable. Cons:eats batteries, lacks a remote, sound quality is average. 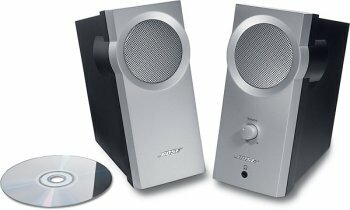 If you can afford the Bose ipod base speaker, you'll love it.It's worth the extra cash.Sound is incredible.Comes with a remote the size of a credit card. I have all three...the Altec Lansing is better than JBL, not as good as the Bose. (3)I bought some rechargeable high-power NiMH batteries at the suggestion of A-L customer support.It' still not enough power.The unit auto shuts-off after 3 minutes. (4)It's going back to A-L for replacement.They are giving me a full replacement.Hopefully, it will work better. 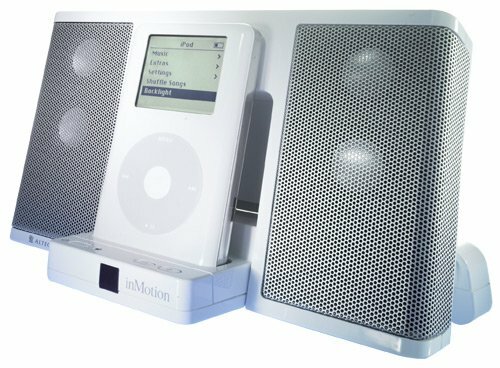 I will be returning the iBoom tomorrow and keeping the InMotion.I don't think the InMotion is perfect.It's not designed to be carryed around like a boombox. My primary need is to use on the deck, hotel, and at the beach. 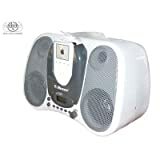 I can't believe Sony, Sharp, JVC or any of the others haven't designed some form of Ipod compatible boom box....come on guys you're missing $$$$$$. The iBoom has acceptable sound--good enough for a hotel room or a camper. The volume can be fairly loud but it sounds poor when turned to the maximum volume. Reception of FM stations in my area is quite good. I agree with a prior reviewer about the battery/electrical cord compartment design. It's the biggest drawback of this unit. The electrical cord will not detach and it must be tucked tightly into the back of the battery compartment before you can insert the batteries. If you need to use the electrical cord, the batteries must be removed to access it. Do. Not. Buy. This. Ever. Never. Never. I went to the electronics store with my mind set on the Altec Lansing InMotion. But oh, how I was lead astray by the "helpful" salespeople that brought me to this. I liked it because it had a radio; InMotion does not, and I do like the radio sometimes. It sounded pretty great in the big, huge store... So I ditched my plan and went for it. I brought it home and I wanted to cry. It sounded horrible in my bedroom. It was FUZZY. On the box it says that there will be some noise/fuzz/a bit of static/whatever when the iPod is switching songs, but I found that this static happened even during the songs, and was especially noticable when the volume was turned down; the fuzz distracts from any musical enjoyment. I couldn't listen to my music down low; it only sounded halfway decent when it was turned up full-blast. Bottom line: it is way over-priced for what it is. Maybe I would understand if it were 50 bucks. But it's not. I didn't give it back to the store... I gave it to my kid brother. I guess he's not as picky about sound quality as I am, or you should be. Don't buy this. As for me, it's back to my FM transmitter and my old trusty stereo, for now. I was very excited when I ordered the iboom for Christmas but disappointed when it arrived. My main problem is the power cable and battery area. The power cable should be detachable and there shoud be a car adapter available. The power cable gets in the way when you decide to use batteries. This IS a BIG problem. The cable should either tuck away neetly or be removeable. got this as a christmas gift and it improves the sound quality by at least 100 times.Makes it extremely loud (not too loud though) and is great for all music or videos.I watched Anchorman using these for my laptop and the sound quality was substantially better than when I used my laptop speakers. I needed small speakers for my Pocket PC as I use it as my Wi-Fi radio, alarm clock, and MP3 player.These speakers are unbelievable!The sound may be small but the clarity is better than my home speakers.The bass isn't bad either.This is the best accessory purchase I have made.You won't believe the sound and volume these throw out! I just got this speaker today, played one song, I knew it right away it's a good speaker. I have been a music fan for many years and my only concern is the sound quality. I don't know what the other reviewer is thinking who gave me a second thought. I still think that depends on the source of music. Because of the price I went ahead and bought it anyway! As someone who travels constantly, these speakers make a perfect hotel room stereo system when paired with my laptop. They'd also make great speakers for an MP3 player. Bass is very respectable considering the size. Overall sound won't make you want to throw out the home stereo, but gets the job done very nicely. 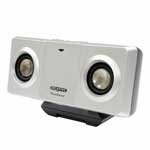 I have also found that these speakers work great for meeting room presentations, up to about 20 people. Three considerations: The AC cord is an unwieldy mess and there is no room for it in the carrying case. The switch on top between the volume controls has little to no effect on sound. Be sure that the device you plan to use with these has bass/treble or equalizer controls. Using these speakers with "flat" sound from a Line Out jack is not recommended. Sound quality is very good for the size. I have yet to test out the claim of 24 hours conitunous use on 4 AA battery. 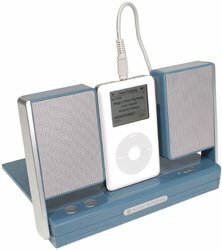 one annoyance is that the base in the middle (between the two speaker) where u put your mp3 player/ipod do not have a no slippery surface. so you player will easily slipp off. 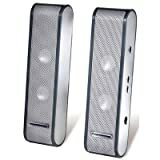 Very good speakers for your mp3 player! 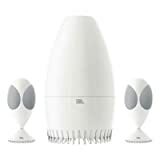 Altec Lansing is known for providing good quality PC speakers for an affordable price. 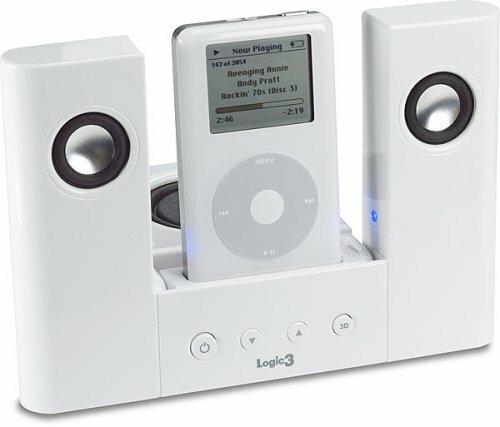 Now they have a hit on their hands in this portable speaker system for iPod or other mp3 player. The speakers are small, easy to carry, nice looking and most importantly sound very good. The speakers themselves measure about 3.5 inches tall and 2.5 inches wide each. The whole unit only stands (when unfolded) about 5 inches tall. If your mp3 player doesn't fit between the speakers, you can set it on the platform behind the speakers, which is nice... which I guess would also accomodate a portable cd player, etc. The thing i was most impressed by is the sound quality. This thing can get annoyingly loud indoors... which is good! With some bass heavy songs, you might need to back it off just a touch (see the opening 20 seconds of Daft Punk - Around the World, or Underworld - River of Bass), but for most music, you can crank it up! Everything about these speakers is very impressive, and reeks of clever design ideas... except one flaw. This is why I only gave it 4 stars. Even with batteries installed (4xAA), the speaker doesn't remember your volume setting when you turn it off. The next time you turn it on, you have to turn the volume back up again. Other than that I'm completely and totally impressed! I'm taking it on vacation with me, and I can't wait! Got these for my MP3 player, excellent sound for the money. Fold up into a nice tiny bundle. Simply requires a headphone jack, so it would work well with any PC or portable player. A bargain if you click on the "Used or New"to the right. Say NO! to stock laptop speakers! The Altec Lansing XT1 speakers are absolutely great!They have a small footprint yet fill a room with sound.They are nicely crafted and come in a well-designed padded case that fits perfectly into my laptop's carrying case.USB powered is the way to go, no external power supply needed!Sets up in a flash! If you enjoy watching DVD's on your laptop, or listening to music, but hate the tiny sound from the stock built-in speakers this is the perfect set-up for you! Shop around for the best deal on these as the prices vary significantly.I picked mine up for about $79.00 to give you an idea.I am not affiliated with the site, but www.pricegrabber.com is a wonderful tool for comparison shopping.I use it for just about everything. I purchased a set of these speakers from the Amazon Marketplace.Despite some problems with the shipping, I am blown away by the quality of the sound from such a tiny set of speakers from MP3 files on my PC.If you enjoy music, these speakers can definitely increase the utility of your PC for a small investment. I travel a lot, and need music. This means that I feel the need to take a mobile sound system with me. So I was very interested when the Altec Lansing XT1 speakers came on the market, and got them days after they first appeared. My setup consists of a 15" Apple Powerbook running Mac OS X and iTunes, into which I have imported a large fraction of my CD collection, and the XT1 speakers. Here are some comments on the XT1 speakers. 1) They plug directly into the USB port of the computer, and draw their power from it. So there's no need for ugly wall-warts and international plug adapters. 2) They come with a very compact carry case, roughly half the top surface area and twice the thickness of my computer. Very light for travel. 3) The sound is superb, given the physical size. Of course, they don't put out a huge amount of power or bass volume, but for that you'd need speakers ten times the size. What they do put out compares very favorably with other speakers of similar size. 4) Setup is easy. Just plug them into the USB port. That's all. I haven't tried them on a PC, so I don't know whether the situation is the same there. 5) The distortion is very low until you turn up the volume to the point where they overload, and then you hear some clipping. 6) Amazon doesn't seem to sell these speakers, even though they have them listed, but go to your nearest Best Buys, where they're on the shelf for about a hundred and thirty dollars. 7) You can also plug other sound sources into the XT1, but you'll need them plugged into your computer anyway because that's the only source from which it is able to take power. These speakers from JBL are an excellent choice for those seaking quality audio and a look that's totally out of this world.I have these attached to my new iMac G5, and so far I'm totally impressed with the sound quality.iTunes never sounded better.Since the iMac's integrated speaker system is less than desireable, this system will definately complete the Mac. The Speakers are very easy to setup.Simply plug in the the left and right sattelites to the sub-woofer, then connect the AC power adapter, then plug the whole system into the audio out port on the iMac.The power switch (button style) is on the center back of the sub-woofer.A green LED on the front of the sub indicates the system has been powered on.The speakers have both treble and bass settings built into the back of the sub-woofer (dial style). One of the most exciting features of this system is the volume controls.There are two chrome buttons on the right sattelite speaker, one "+" and one "-".Simply touch the appropriate spot and the volume goes up or down.Tap it for incremental increases or decreases, or hold for fast increases and decreases in volume.Touch both at the same time to mute the system.To bring out of mute, simple touch either button. Overall, I have to give this speaker system 5*****'s.I really can't think of any con's as it relates these speakers.I purchased my set through dynadirect for $99.00.The average retail cost is $199.99 if you were to buy them from the Apple store.Save some money and be pleasantly surprised by the quality. i suppose i expected too much from sony on this 1.i am a loyal sony consumer because of their high quality and true to their word advertising.sony really missed the mark on this product however.the quality is good, but the bass is missing! i got on amazon and started browsing through mobile speakers. i bought these and a smaller sony version that says(blue) attached to the end of the name, those were about $40 dollars, not to bad I thought, but i work in a cooler with a many large fans blowing, so the sound quality/volumewere not enough for me.I was lucky and came across these at a local furniture/electronics store. there were about $80 there so it is wiser to get these at amazon.com. I love these, i plug it into my sony hd mini-discman nh600d, and now instead of carring around a backpack and a 128 cd case, i can take about 70% of my cd collection which is alot more then what is in that single 128 case to work in the palm of my hand or in a few extra HD 1gig discs. there are others complaing about sound quality, you do lose a little but come on people that is to be expected, this thing is about as long as DVD case and half as wide and about 1 1/2 inches deep, so yes the sound quality is never gonna be the same as a $80 or $200 radio/boombox.the sound quality in my opinion is amazing for the size of this thing.you are always going to lose something to gain a little something, and I for one do not mind this very little loss in quality, now almost all of my music can go with my anywhere. i would recommend these to anyone looking for a great portable speaker. These speakers are small, but sound that way.They remind me of what a little transistor radio use to sound like.One of my mp3 players would not even power it enough to be heard.My iPod Mini produced enough sound to be heard slightly across a room.I would not recommend this speaker system. Put the PODWAVE on your IPOD, slip it in your shirt pocket with an audio book playing and scoot down the road for hours of no hassle in car sound. Want something for beside the bed in a motel room to lull you to sleep, great product. Want to listen to super fidelity, loosen up with the dough and get some Shure earbuds. Introduction, by Barbara "Mrs. Nemo"
Every summer we drive to California in our VW New Beetle. John and I stuff in our clothes and cooler, maps and hiking boots with no room to spare, except for his computer and music tapes and CDs and a boom box to play them on. The boom box is an important summer accessory because it lulls us to sleep each night. I hear five minutes or less of Mozart and I am out cold. (Or is it the fog, or perhaps the great food and too much wine?) But I resent the space that ugly boombox takes up in our tiny car. Packing for the trip has a new challenge this year. We are bringing our puppy, a six pound Havanese, with all her paraphernalia, a crate, some blankets, toys, food, and doggie bowls. Where shall we squeeze in the computer and boom box around a dog? John has solved our musical problem with the recent acquisition of an iPod and PodWave. It's a little speaker that fits on top of the iPod and will play lullabies for us each night. Sweet dreams for us, and less arguing about where the hiking boots fit in and does he really need four Photoshop books and backpacks full (...). Thank you, iPod and PodWave. You have saved our marriage and family for another year. But we are mailing our clothes to California because puppy needs space in the VW. Prior to PodWave's arrival, my super duper 30GB iPod (3rd generation) was deficient in one important category. 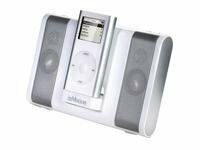 Without a built-in speaker, there was no way to listen to any music on the iPod without earphones or a car adapter. Remove PodWave (PW) from its plastic package, place the included throwaway AA battery into a compartment within PW's cylindrical plastic case, insert PW into audio port on top of iPod, move a single small black switch from off to on position (a LED indicator would be helpful), turn up iPod volume to high, and listen out in the open (preferably indoors). That's it! (...)This device is simply great, meaning it's v-e-r-y easy to use and ideal for casual (non-audiophile quality) listening. Sound quality is decent, given PW's small size and tiny speakers. Midtones are clear and crisp, and high frequencies are acceptable. Bass is somewhere between inaudible and nonexistent, but who cares? Distortion is minimal, and pop music sounds fine, as does most jazz and classical. I recommend you use rechargeable AA's instead of single-use batteries, for environmental reasons, if not for longer audio time. Your mileage will vary; I get a LOT of playing from a single rechargeable! If audiophiles give me grief due to PW's "tinny" sound, they can take a long one-way hike with their $500 earbuds up the nearest peak. Because in real world usage, I intend to keep PodWave close at hand for listening around the house. It's cute, affordable, convenient, reasonably sonorous, and it works! 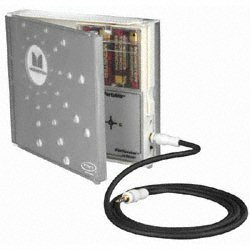 If you need ambient audio (mostly indoors, as opposed to outside or in the car), get one today. With technology what it is being able to cram incredible sound into tiny spaces (witness the incredibly expensive Bose tiny shelf speakers) it is amazing that the company that made this was not too embarrassed to put this tinny (and I don't mean tiny), barely audible set of speakers it on the market. It would cost more money to return this to Amazon to keep it and thus is the end of this story. . . It looks cool, but sounds terribly quiet. When you max out the volume the sound distorts. Also, if you have any sort of case for your iPod, the PodWave will not sit flush and will not make a full contact. Additionally, it 'spins' easily and loses contact that way. But here's the worst part; If youre playing a song and you lose contact, the iPod pauses your music! 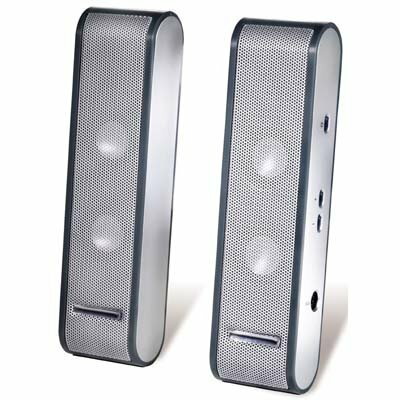 I bought these speakers to use with my HP Pavilion Laptop computer to by-pass the tinny sounding laptop speakers.I just got them today and I am very pleased!They arrived in 2 days by UPS. All you do is plug one USP plug into your laptop and the other end into the speakers.That's it!The 5 step installation process for Windows XP users, is simple and fast.In fact, if you just wait a few minutes, Windows XP may install it automatically for you.There are no power cords or anything else to bother with.Each speaker is about the size of a music cassette, so opened up it would be like 2 cassettes side by side. Two very cool things about these speakers.1) The USB cord self retracts into this little spool to make things tidy.2)The corners of the speakers have these blue LED lights that glow when you've connected the speakers to your laptop. (They look great at night. )A couple of bonus features I didn't expect. In summary, for this very reasonable price, you can't go wrong.I only wish I had bought these a year ago, instead of waiting so long. I found the DX4's to be good speakers for the money. If you are into surround sound gaming, they are not for you, but they are perfect for music on the desktop. Note that these aren't just for computers. They have standard line-level inputs on the back, so you can attach anything to them, such as an iPod or CD player. The cabinets are sturdy (and heavy). The cones are exposed though; there is no grille to keep curious cats, ferrets or toddlers away from the relatively delicate material of the speakers themselves. Keep this in mind when you choose a location. The headphone jack on the front is a very nice touch, but I found the midrange boost control feature to be of little value, at least in the room I was in. Your mileage may vary. Sure, you could go get "real" stereo speakers and an amp to drive them, but if you want some good sound on a budget these speakers with built-in amp will treat you well. 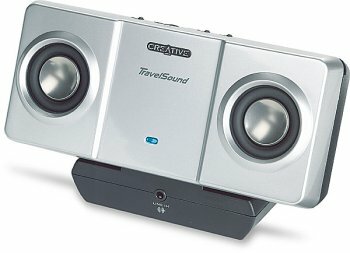 Top of home, office, or studio computer speaker systems! Just hooked these up yesterday and I am loving them. I have the top of the line dual 2.5gig G5 mac with 23 inch cinema screen and these are by far as good as the rest of this system. Was not sure which speakers to get so I went to the Mission Valley Apple store here in San DIego and listened to every set they had on display. There were six sets in all and these studio monitors blew the others away. The sales person agreed and was surprised because he had dismissed them because they did not look as cool as all the others. If you are into music and listen to voice recordings then these are for you. We played the same song on each setup they had and these were the only ones that had full sound and all the highs and lows but most importantly the mid range sounds too. We discovered that these were the only speakers that played the string instruments on the recording. The other 5 didn't. If you have an Apple store near by, I reccomend you go and check these out for yourself. Beside the obvious reason of listening to actual studio monitors there, you will be fascinated to see the store of the future, Apple. Just bought these at a local store.They are a lot better than the laptop speakers.A whole lot louder, too. The sound is pretty good. It is just a little bit better than Laptop speakers. I use it for my projector and it will be loud enough to fill a room with sound 35x35 feet. Don't expect much bass though unless you turn down the volume alot. It can run 35 hours on battery which I think is really good. I never watch TV at home.As soon as I get into a hotel room, however, I immediately switch the TV on.When I travel with these speakers and an MP3 player or laptop, however, I set up some background music and don't waste my life watching the Weather Channel.I've had mine on the road for more than 70 traveling days and in checked soft-ish airline bags for perhaps 10 flights.So far they are still working well. At this weight you can't expect an authentic reproduction of a 9' Steinway grand piano.But these are vastly better and louder than the speakers built into laptop computers. TRAVEL SPEAKERS! Great, depending on your needs. These speakers were quite surprising at first listen. For the miniature size (and they are small) these speakers really put out a nice loud sound. Almost unbelievable. 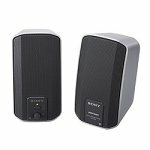 These speakers will work best as sound for a ONE ROOM environment. Don't plan on replacing your home stereo. The main complaint from most users is that the speakers distort under high volumes. You can't expect home stereo sound from a tiny unit like this. But, believe me, the sound is more than adequate for travel purposes. For example, these are perfect for a hotel room or a nice sound source during a day on the beach. They are MORE than adequate for those types of applications. Don't buy these speakers with the intent that they will serve as at-home computer speakers. These things are fantastic for the road and best of the best in travel speakers. However, sometimes people can expect more than is technically feasible. Considering the size and price, these speakers ROCK! 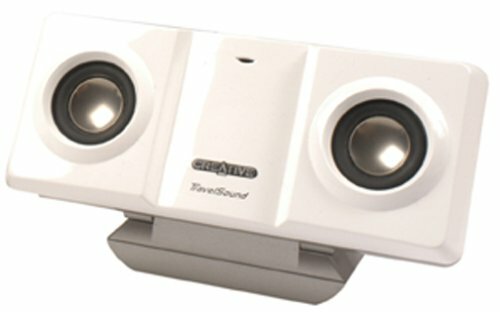 I recently purchased these speakers and was amazed at how bad they were. These are not cheap speakers. The purchase was for my CD player and computer. The problem is that when you turn up the volume to any decent level, there is buzzing and alot of noise, especially on any bass tone. There is also a switch at the top between the up and down volume buttons that's supposed to produce a "Wide Stereo Effect". It actually makes the noise worse. While they do look nice (though they have a tendency to fall over), the sound quality make these not worth purchasing. Don't want to wear headphones just to enjoy a little of your own music back at the hotel? Take some speakers with you. With SRS-T33's single chassis and compact, foldable design, Sony's 1-watt-per-channel portable speakers will travel wherever you do. The little package even offers cable and plug storage management. The speakers' 1.3-inch (34 mm) neodymium magnet drivers produce high energy output for impressive speaker movement, power, and sonic accuracy, giving you remarkably good sound from speakers occupying little more space than a CD case. Sometimes referred to as a rare earth magnet, neodymium offers 15 times the strength of a traditional strontium-iron-based magnet. This strength grants greater power handling and higher frequency reproduction. Kick in the unit's Mega Bass circuit for a boost. The SRS-T33 is magnetically shielded to avoid interference when placed near or atop a TV, laptop computer, or monitor. The speakers operate for about 24 hours using 4 AA batteries (not included) and weigh approximately 8 ounces (without batteries) or 12 ounces (with batteries). 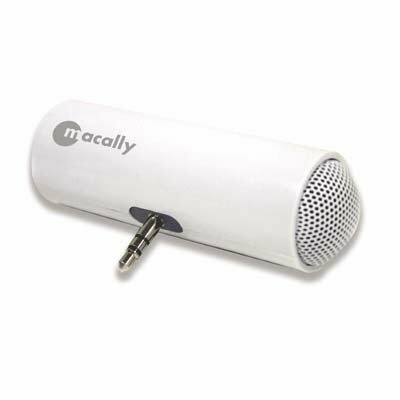 The unit can also be used as passive portable speaker system, with no batteries or external power source required; just use the headphone amplifier on you portable device. Optional accessories include the AC-E60HG or AC-E60A AC/DC power adapters. I purchased this product and specifically wanted to use it with an AC power source.As you can see from the technical specifications, it can use the optional AC-E60A AC Adapter. (The same note is provided on the Sony web site. )That is not true.I spent a long time today with Sony support and the same answer from everyone was that, in fact, this speaker is not compatible with an AC adapter.If you want to use batteries, fine (although it did sound "tinny"), but if you want to use an AC power source, look elsewhere. I wanted a small, portable speaker for my mp3 player that didn't cost too much and had decent sound.This unit fits all of those criteria and I'm happy with it.No, the sound quality isn't extremely high fidelity and the bass lacks depth, but it gets the job done. A terrible choice for portable audio. I find it hard to believe that any of the reviewers who have made positive comments have actually listened to and compared several different sets of portable speakers.If they had, they would tell you to avoid these losers. The sound is tinny, even with the amplifier on.With only .15 watts per channel, you get volume only marginally above that of a typical set of headphones just lying on the table. These might do OK if you put them on the pillow next to your head, but I suspect that you will still be disappointed. Instead, consider the Panasonic RP-SPT70 travel speakers.They are, when folded, only slightly larger than the T33s.They use four AA batteries and have 1 watt of power output per speaker.They also cost about $10 less than the Sonys. To be fair, the Sonys DO fit in just about any handbag or briefcase.And they are very solidly constructed.But this does not compensate for the poor sound quality. I personally bought this item in silver, but assume it's the same as the blue. I always travel with my laptop and have been wearing headphones to hear good sound or listening to very poor (if audible) quality from the speakers on my laptop. These speakers, at $40, do a great job; no more headphones in the motel room. Without batteries, it's useless, but I installed normal alkaline batteries and got as good, if not better sound than the TV in my expensive hotel room. I've listened to music and DVD's on this speaker and won't wear headphones on the road again. The cables from my amplifer to my speakers at home cost more than $40 and this certainly doesn't duplicate that sound, but for a traveler or for someone going on vacation with their family, this speaker, at $40, is a great value. The only reason I rated it a 4 stars rather than 5 stars is that, as we all know from experience, there will be better speakers tomorrow. (Today, it deserves 5 stars). I purchased these based on a recommendation in one of my outdoor magazines.I was quite disappointed. The sound is mediocre at best.The "megabass" advertised on the package is a joke.The speakers are easily overwhelmed and quick to distort.Have you listened to music on a very cheap clock-radio?These are step below that. Definitely not worth the $40 I paid.I'm returning these and going back to a pair of Sony travel speakers I purchased about 15 years ago.They're larger, but sound much better. The SRS-A202 active speakers will morph your personal CD player or radio into a substantial sound system. With their compact size and shape, these speakers are perfect for a dorm room or office. The four watts of power, along with the 57 mm driver units provide quality sound with a wide frequency. The speakers feature a dynamic sound duct for deep, accurate bass sound. To enhance the bass sound, Sony has installed a built-in Mega Bass sound; this boosts the sound quality, especially at low frequencies. With magnetic shielding, you can be confident that the speakers will not harm the quality of other near-by components, like a TV or computer monitor. There are two inputs on these speakers, allowing you to hook up two different sound sources. The on/off switch and volume control are located at the front of one of the speakers. The two speaker cords are a full two meters long, making it easy to properly separate these speakers for excellent sound. Take your Walkman or Discman to a new level with these active, compact speakers. I agree with the viewer preceding me. Very tinny. The ones I was using from my old computer sound 100% better. These are a complete waste. Two stars because I do hear the music but it sounds awful. 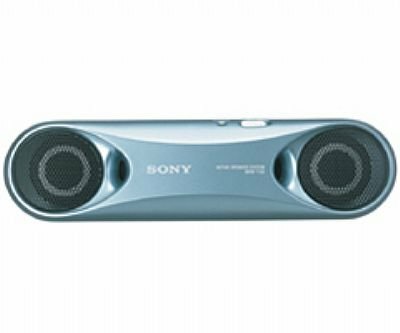 These speakers were a major disappointment.I have speakers that are about 5 years old, and wanted to replace them.But these Sony speakers were AWFUL - the sound was tinny, the bass was almost non-existent, and the sound was probably worse than that coming from my built-in laptop speakers.